Culinary industry has many rewarding career choices. We are familiar with that of chef, tea taster, wine taster etc. Chocolatier, is one such appetizing career that people are not much aware of, but has much scope as chocolates are always in demand to the young and old alike. Chocolate is unique in that it can be both a fundamental ingredient and a finished candy by itself. Chocolate is derived from the beans of the Theobroma cacao tree, but the substance we know as chocolate undergo a complex and lengthy process before it becomes the smooth, sweet food we are familiar with. The term 'chocolate' can refer to a variety of different products, whose characteristics and taste depends on the ingredients and methods used during processing. Chocolate products can range from small milk chocolate morsels to blocks of unsweetened chocolate to bars of white, milk or dark chocolate, with different variations. A Chocolatier is an expert who makes confectionery/ sweets from chocolate. He is a type of chef who specializes in chocolate and can craft a wide range of delicious, tempting chocolates. In other words, Chocolatier is an artist who works with chocolate to create masterpieces that are both beautiful and delicious. 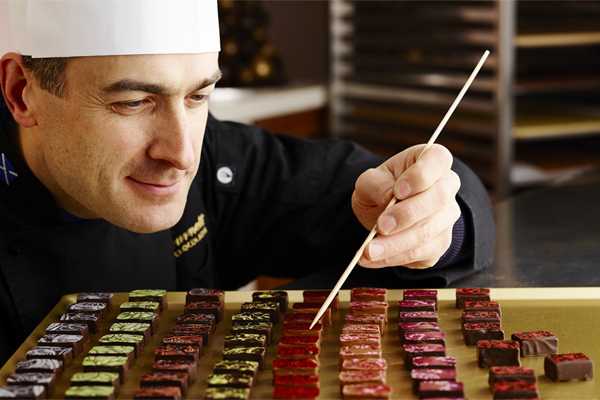 A Chocolatier creates various chocolate based products like bonbons, pastries, cookies and artistic chocolate mouldings. Chocolatier has knowledge about chocolate formulations, the procedures for making chocolate candy, and the history of chocolate. A Chocolatier and Chocolate maker are not the same. Chocolatier depends on the Chocolate maker for raw material to create his own sweet products. The chocolate maker manufactures chocolate bars and powders from dried cocoa beans. The Chocolatier takes these processed chocolates and combines them in personal recipes, along with other ingredients, to create decorative candies, bars and other desserts. When it comes to starting ones own business and marketing, Chocolates manufactured must be unique, innovative and of best quality. Most important is the packaging, i.e how you present the product. As home made chocolates are most preferred by customers, scope is much more for this career.